Catalan Network Clusters are 30 clusters that represent different businesses with specific weight within the Catalan industry. We all share a set of values and objectives that are derived from fundamental one: improving business competitiveness. From here, each of us structure an organization led by a number of corporate members, and focused on executing a work plan. This work plan translates into a portfolio of services including basic elements as strategy, innovation and internationalization, which may include other aspects such as networking, training or visibility. 30 clusters have an established track record we have structured projects both collective and individual projects that have effectively improve the competitiveness of many companies and businesses in Catalonia. Our vocation is to continue working with this clear objective, involving more and more companies and having a growing impact on the Catalan business. On May 8, 2014 we reached a favorable resolution as we have entered the “Catalonia Clusters” program of the Government of Catalonia resolution as we have entered the Catalonia Clusters program of the Government of Catalonia. – Using the brand associated to the program. – Training of cluster managers. – Mentoring and advising on international cooperation and innovation. – Linking innovation policy instruments and internationalization through the clusters. – Others that the Department of Enterprise and Employment boost in the field of work in clusters. The ITC / 2691/2006 order, of August 2, defines the Innovative Business Groups (Agrupaciones Empresariales Innovadoras (AEI) as “the combination in a geographical area or specific industrial sector, of companies, training centers and units of public and private research, involved in collaborative exchange processes aimed at obtaining advantages and / or benefits arising from the implementation of joint projects of innovative character. This activity is organized around a market and a segment of objective market and / or a relevant scientific-technological sector. The aim of the AEI will be to reach a critical mass such that would ensure their competitiveness and international visibility. Thus, the AEI is the administrative name chosen by the Department of Industry, Tourism and Trade (MITYC) for “innovative clusters“, which are registered in the corresponding Special Registry. INNOVACC is registered since May 22, 2008 in the AEIS Register of the Department of Industry, Tourism and Commerce with the number REAEI-00023 and has the excellence consideration required to be part of this Register. In December 2011, the INNOVACC Strategic Plan 2012-2015 was presented to renew the registration in the AEIs Registry. On May 11, 2012 we are notified of the renewal of the registration in the AEIs Registry of the Ministry of Industry, Energy and Tourism. In March 2016, the new INNOVACC Strategic Plan 2016-2019 was presented to renew the registration in the AEIs Register. On June 20, 2016 we are notified of the renewal of the registration in the AEIs Registry of the Ministry of Industry, Energy and Tourism. 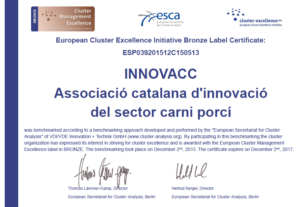 INNOVACC obtained the quality seal Cluster Excellence Initiative Bronze Label, by the European Secretariat for Cluster Analysis (ESCA) on 13 December 2013. On December 2, 2015 obtained the renewal. On January 16, 2018 obtained the second renewal. This quality seal Cluster Excellence Initiative Bronze Label, endorses the commitment and effort of the Cluster to achieve excellence in management. This entity recognized at European level assesses key aspects of clusters such as: management, structure, funding sources, government bodies, projects, success stories, services and activities aimed at innovation that offers cluster members, and the sector it represents, based on criteria of European benchmarking.